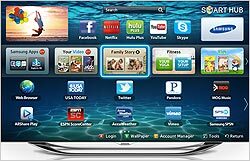 While desired apps for new smart TV come from the most popular online destinations, such as Netflix, YouTube and Facebook, many consumers are still not familiar with the functions of these new TV sets. According to a new Harris Poll, 47% of smart TV owners and 34% of non-smart TV owners want Netflix -- the No. 1 app for new TV sets. Next comes YouTube (owners register 44% number/non-owners 31%) and Amazon Instant Video (owners 34%/non-owners 23%). Social media giant Facebook (owners 35%/non-owners 29%) and online radio leader Pandora (owners 28%/non-owners 18%) round out the top five. Looking at traditional TV brands, the most desired app comes from ESPN, 21% of smart TV owners, and Syfy, at 14%. Still, there is some confusion over what smart TVs do. Harris says almost three-quarters (73%) of non-smart TV owners indicate that they are not that familiar (39%) or not at all familiar (33%) with smart TV or Internet-connected TV. Harris says this could be a problem for future TV set purchases. The survey says only 7% of those who are not familiar with smart TV are likely to purchase a smart TV within the next 12 months. But those more familiar with smart TV are four times more likely to purchase a smart TV, with 29% suggesting that they are likely or very likely to make a purchase within the next year. Manny Flores, senior vice president of Harris Interactive, stated: "As the TV becomes a more overall entertainment device, it is only a matter of time before we see the mainstream use of additional content apps, such as Facebook, being used on the TV." 2 comments about "Consumers Catching Up With Smart TV Apps". Doug Garnett from Protonik, LLC, July 19, 2012 at 5:52 p.m. Interesting that only 47% of smart TV owners want Netflix. I would have expected that to be far higher. John Grono from GAP Research, July 19, 2012 at 7:46 p.m. Totally agree Doug. While I don't have the data for the US, there is an analogy with VCRs. VCR penetration remains 'high' simply because people haven't thrown the VCR recorder and their VCR tapes away yet. But VCR usage has dwindled and would barely rate an asterisk these days.